Pai Gow Fever has both the standard casino Pai Gow Poker and an exciting variation with Fever Mode, where you can redraw one card or your entire hand if you have a win streak going. Play for fun or practice - both in one beautiful Universal app that runs on both iPhone and iPad. 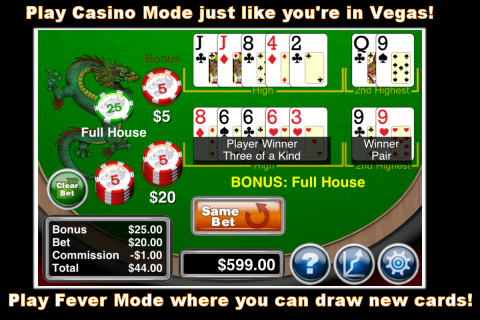 Pai Gow Fever is a vivid, exciting iOS version of Pai Gow Poker, found in many casinos. Prepare for your trip to Las Vegas, Reno, or Atlantic City by practicing making bonus bets and pressing your bets on a hot streak. 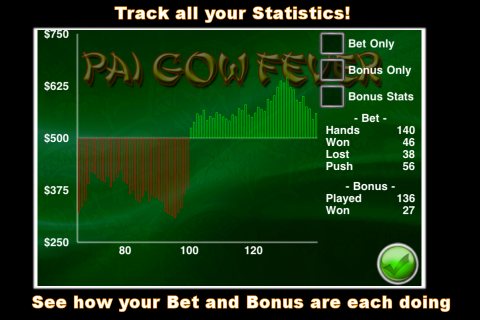 Pai Gow Fever keeps track of your wins, losses, and bonus bets for you to review later. If you've never played Pai Gow Poker before, Pai Gow Fever teaches you the basics with context specific tips. If you don't know how to split a hand, you can always ask for Advice ("House Way"). See if your guess is what the house would do. Double your bets by sliding your winnings to the bet stack. Make change by double tapping your stack. Quickly push the advantage when you're winning.